Reus in Spain is a picturesque town that was once famous for the production of Brandy. Today it is a bustling town that spans 59km2 and has 100,537 inhabitants. Reus Tourist Guide will help you find all the tourism information you need whether you're travelling through Reus or spending your holidays here. Reus international airport is popular with budget airlines like RyanAir which fly in from destinations all over Europe. With a transfer time of around 1 hour 20 minutes to Barcelona, flying to Reus also offers you the possibility of obtaining a low cost flight if you can't find a cheap fare directly to Barcelona airport. 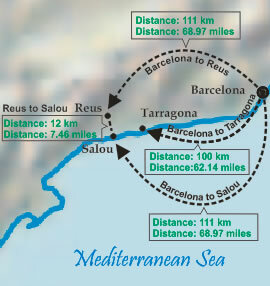 Map showing Reus in Relation to Barcelona, Salou and Tarragona. Reus is near the east coast of Spain 10 kilometres from the coast of the Costa Dorada. (Also spelt Daurada) and 111 Km from Barcelona. The nearest town on the coast is Salou which is 12 kilometres south of Reus. Other coastal towns and resorts within a half hour drive include Cambrils and La Pineda. 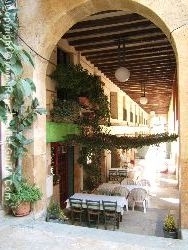 When traveling from Reus to Barcelona you'll pass through Tarragona. Tarragona has some stunning Roman architecture. It has been recognised by UNESCO and is worth a visit. I am reliably informed that it also has some excellent nightlife by a local resident of Reus. 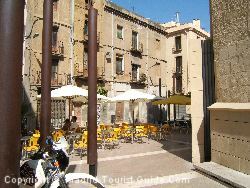 It's feasible to travel to Tarragona from Reus to sample the nightlife as the journey by car takes around 20 minutes. The Port Aventura theme park is approximately 8 kilometres from Reus, Spain. Reus makes a good place to stay if you want to visit the theme park, and you have a car. Ryanair offer frequent flights to Reus, Spain. Reus has its own small airport and the flights to Reus are generally very cheap. To drive to Reus from Madrid takes approximately 6 hours. The main motorways that you need are the A2 out of Madrid, and then the A7 in the direction from Barcelona to Valencia. Reus is the home town of Antoni Gaudi the famous Catalan modernist architect, although, ironically, there are no examples of his work here. Instead you'll see lots of Lluís Domènech i Montaner's work. He constructed several buildings throughout the city in a modernist style. There's a Modernist Route through the town that you can walk which bypasses all the best buildings. In June the town enjoys its biggest fiestas, and you'll see live music in all the town squares every night, and street entertainments. You'll also see the famous towers made of men (Castellers) - unless they tumble down that is! There are quite a few bars and restaurants in Reus and the ones I tried had some really good tapas and menus of the day (Menu del dia) for reasonable prices. In the summer terrace bars spring up all over the place. Reus is in an easily accessible location thanks to its airport and the motorways that near by. It has plenty of interesting sights and in addition it's only 10 km from the beaches of the Costa Dorada and 100km from Barcelona.